Kim Edwards' The Lake of Dreams is a little bit sleepy novel. The story follows Lucy, a young woman who has escaped the pain of her fathers sudden death by traveling the world and staying far away from her family home in the Finger Lakes region of New York. When she finds herself at a bit of a dead end in her life with her boyfriend in Japan she decides to travel home to The Lake of Dreams (the name of the town she grew up in) after her mother is in a car accident. Here Lucy must confront her past and the fact that everyone in her family has moved on from her father's death but her. Staying in her childhood bedroom, Lucy finds some old letters in a cupboard concerning a ancestor who no one in her family seems to know about. Lucy then embarks on a quest to discover more about this long lost relative - Rose - to uncover her families secrets. Lucy ends up finding a connection between Rose, who participated in the woman's suffrage movement, and a famous stained glass artist from the area - Frank Westrum. A large part of the book focuses on a series of stained glass windows that depict biblical scenes from the women's perspective. 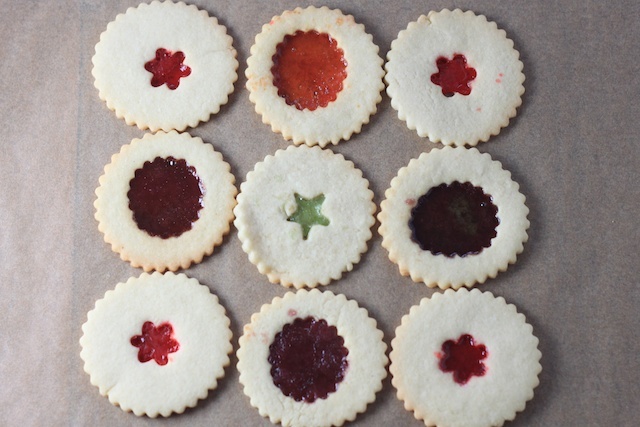 Hence, these stained glass cookies which I haven't made or even thought of since I was a kid. In all honesty I was a bit bored by The Lake of Dreams. 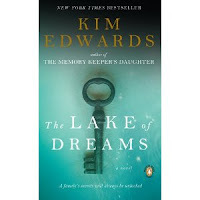 I found Kim Edwards previous book - The Memory Keepers Daughter a really fascinating and engrossing read with a shocking secret that really drove the novel. The problem with The Lake of Dreams is that the secrets involved are really not that shocking or interesting. I wanted to like Lucy, the main character, but in the end I found her similar to the Liz Gilbert in Eat, Pray, Love - a young woman who was clearly lost and unhappy but not for any definable or sympathetic reasons. With Lucy, I just didn't get why she was so unhappy. At 18 she lost her father unexpectedly, and while I can certainly sympathize with the pain of a loss of a parent, when we meet Lucy it is 9 years later, she has traveled the world and has a great partner, Yoshi, but she yet she not content. When Lucy returns home to upstate New York from her home in Japan she finds that her mother and brother have moved on since the loss of her father many years ago. Her husband is settling down and starting a family, her mother is starting to date and contemplating selling their rambling old family home. I understand Lucy's angst with all this change, but what I did not necessarily understand is how it led her to become obsessed with some random forgotten ancestor who had a minor role in the women's suffrage movement. This ancestor is named Rose - she emigrated to the U.S. with her older brother and became a disgrace both because of a pregnancy and her arrest after participating in women's suffrage march. Now don't get me wrong - I am a staunch feminist - but I am starting to worry about myself because there have been several books that I have read in the past year that have dealt with women's suffrage or women's awakening during the turn of the century and I have disliked all of these books (see this, Remarkable Creatures and Private Life). Now you may be asking, I see pictures of stained glass cookies here, what does that have to do with anything? That was another kind of random subject of the book that I did not find that compelling. Touring an old church in her hometown after her return, Lucy comes up a beautiful stained glass window featuring a mysterious woman and a pattern that is the same as a blanket Lucy found in her house. The window is by a famous stained glass artist Frank Westrum and after some digging and trips to Rochester and other exciting places in upstate New York Lucy discovers a connection between her ancestor, Rose, and Westrum. This obsession with the stained glass doesn't really go anywhere and to some extent I think that the author put the stained glass in the novel to re-connect Lucy to her high school sweetheart who now runs a glassworks in town. There is some romantic tension between these two but it does not go anywhere. So, in the end, I don't really now what to say about the book. It was just blah and I am sorry that I cannot recommend it. But I will look forward to Kim Edwards' next novel and hope it is better. These sugar cookies with candy stained glass are probably most often made at Christmastime as little tree ornaments. It is a mistake to relegate them to decoration though. 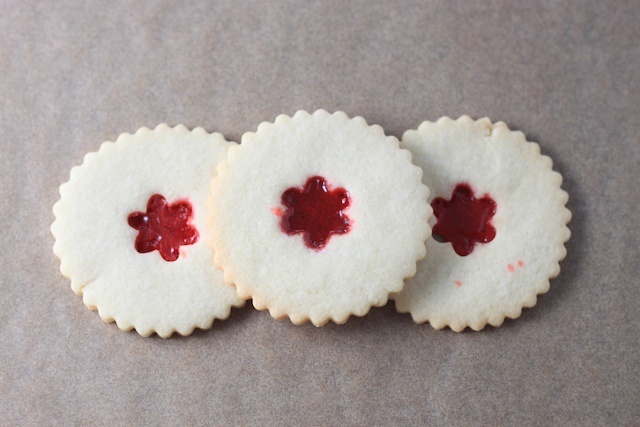 This particular recipe makes really perfect, crisp sugar cookies that are truly addictive. I think if you had egg cookie cutters these could make great Easter cookies or anything spring - themed. 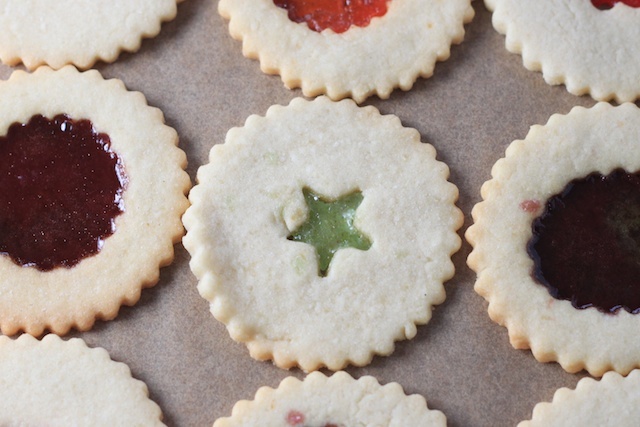 Of course these perfect cookies are from Gourmet Magazine, sniff, sniff. 3 cups or so of candies - I used life savers, jolly ranchers would be good too. First crush the candies. Separate them by color, and put each color in a little baggie. Wrap the baggie in a kitchen towel and then smash the hell out of those little candies with a rolling pin until the are crushed. The smaller the pieces the better. Set aside. Combine the flour and salt in a bowl and whisk together. Add the flour and mix until it just comes together. Turn the dough out onto a work surface and divide into three pieces. Shape each into a disk and wrap in plastic. Let rest in refrigerator for at least 2 hours. Preheat the oven to 350 and line 2 cookie sheets with parchment. When dough has rested take one package out and on a well floured work surface with a well floured rolling pin roll the dough out until it is 1/8 an inch thick (which means pretty thin). Cut out shapes of your choice with smaller shapes inside of your choice. Transfer to the cookie sheet. Add about a 1/4 teaspoon of crushed candies to the cut out holes, more if the cut out is bigger. Repeat with the remaining dough disks. Bake until the edges are golden - 10 - 15 minutes. Let cook completely in pan on rack and then remove from pan.